Here in the inside of a standard residential meter socket. The electric from the power company come in through the top and attach to three lugs. From right to left the are. Hot (A), Neutral and Hot(B). 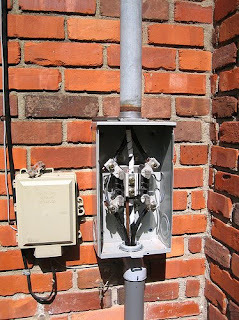 The meter gets plugged into the socket and completes the connection between the electric company and your home. The bottom three lugs go to you home's electric panel and match the configuration of the lugs above. THE POWER IN A METER SOCKET IS NOT FUSED AND CAN NOT BE TURNED OFF. ONLY TRAINED INDIVIDUALS SHOULD OPEN THIS UP.